Registering is not always about selecting items you don't have; sometimes you need to replace existing items. When we registered for small kitchen electrics we did a little bit of both. Our two upgrades were the blender and the toaster oven. The blender was originally purchased by Christine during college and got left behind with David and then I asked if I could have it. But it wasn't the best blender in the world and lived at the bottom of our pantry seldom being used. Then I purchased the toaster at Macy's almost three years ago during Black Friday so it was really cheap and over the years the timer had stopped working which was very hazardous. I think those things warrant an upgrade, don't you?! Our "new" kitchen electrics that we wanted to add to our collection were a food processor and an ice cream maker. Whitney and I really wanted a blender that could competently make smoothies, which is something our old blender failed miserably at - we often needed to open the top halfway through and stir things with a spoon to try to coax them to get pulled into the blade, and even then it would take a while to blend and we'd end up with undesirable chunks of ice and other ingredients. That was our primary requirement, and we didn't need one that kneads dough or pulverizes iPhones (as fun as that would be). My search led me to the Ninja blender above, which based on the reviews, seemed like it would easily handle our smoothie requirement. I liked the limited number of easy to understand buttons, and it also has a unique single-serve feature where the pitcher can be swapped out for a cup with its own blade, which has come in handy every now and then. We have really been enjoying this blender. It's really convenient to throw a handful of ingredients in in the morning, blend for less than ten seconds, and get perfectly blended breakfast smoothies for both of us. I just throw in a straw and then I'm having my breakfast on the way to work! It's a great time-saver on those days when I'm running a little late. When Whitney and I moved in together, I had a hard time understanding why she still wanted to keep the toaster oven on the counter when we had a perfectly good toaster and oven. Over time I realized she used it for just about any baking task that would fit into it, and that it was actually quite convenient and efficient to put things into a small countertop toaster oven instead of having to preheat the whole big oven for a small dish. Therefore, I was excited to replace our ailing old toaster oven with the broken timer and plastic bread bag permanently burned onto the top of it with something that would safely turn itself off when I told it to. 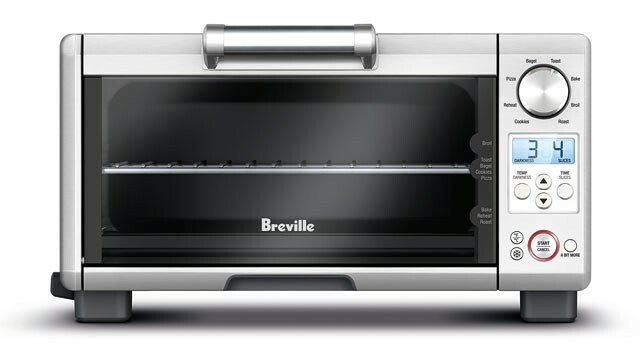 I settled on the Breville toaster oven above, which has a number of nice features. The LCD and simple controls make it very easy to input the exact time and temperature I need. The inside of the oven is spacious, large enough to bake a pie or a 9x9 casserole, but the whole thing is small enough not to dominate our very limited counter space. And best of all, everything we make in it comes out perfectly! With the big oven I notice a lot of variability in the baking times recipes give vs. how long things actually take, probably due to temperature variations in the large oven space and maybe a longer time to adjust the temperature to the target (or maybe a busted sensor, who knows). In the Breville, I feel like the baking times much more consistently align with what the recipe says. It also toasts perfectly and has a roast setting that we've used to very quickly and conveniently roast vegetables. I would highly recommend this toaster oven to anyone looking for one! We often found our mini food processors (I think we had at least three at one point, but got down to one when we moved to our current place) to be very useful for various chopping tasks, but we were also limited by their size (two or three cups) in that we needed to split tasks into multiple batches, and many food processor tasks are not suited at all to the small size, like making dough. With this in mind, I sought out a larger food processor, and ended up picking the 9-cup Cuisinart above. It comes with a number of useful blades and a simple ON-PULSE-OFF interface. We've really enjoyed using it so far for some simple chopping and grating, and we'll be sure to blog about it when we try out the more advanced features! 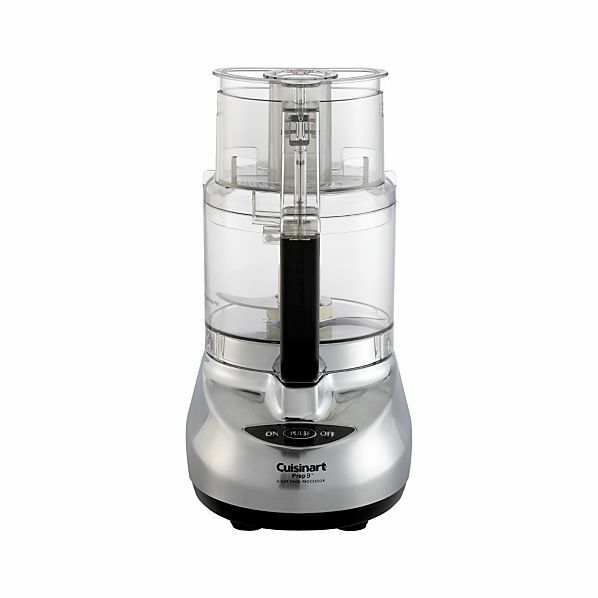 Whitney and I thought this ice cream maker attachment would be a fun addition to our KitchenAid, and would allow us to try our hand at ice cream making without a new dedicated appliance for that purpose. We were right! We have really enjoyed making ice cream on two occasions so far (vanilla and pumpkin), and the results have been very tasty. There's been a little trial and error in terms of learning how to use it, but I think we've figured it out (always helps to read the manual) and look forward to making more!